August 16, 2018,: Manufacturer of the lifestyle and adventure Pick-up, ISUZU D-MAX V-Cross, Isuzu Motors India has signed on former South African cricketing legend and an adventure enthusiast, Jonty Rhodes to promote the brand and V-Cross in India. The announcement comes at a point when ISUZU is establishing itself rapidly as an important player in the Indian Pick-up and Utility Vehicle market. The association brings together a distinct combination of ISUZU’s thrust on ‘Never Stop’philosophy and Jonty’s strategy & excellence of being ‘game-changer’ in the world of Cricket. 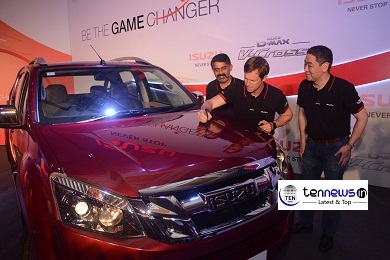 ISUZU launched its latest commercial, featuring Jonty Rhodes, underscoring the message ‘Be the Game Changer’ at a press conference held in Mumbai, today. Jonty drove the V-Cross to mark his association with ISUZU in India in the presence of senior management executives, business partners and media.